Entune now encompasses the complete audio display stack of your vehicle – including Bluetooth, voice recognition, USB, aux port, and your display screen. On select, premium audio head units, you have access to navigation and a rich set of Apps and Data Services, now referred to as the “Entune® App Suite”. Getting started with Entune is easy: Register your Entune account and link your existing apps to Entune, then download the Entune app from your favorite App Store, such as iTunes®, Android Market or Blackberry® Appworld. Once the phone app is launched and the phone is paired and connected to the vehicle using Bluetooth®  wireless technology or a USB cable, Entune’s apps are accessed using the vehicle’s controls or, for some services, voice recognition. What is Entune® App Suite? Entune® App Suite 8 is a collection of popular mobile applications and data services accessible from your Toyota. These services are delivered via most smartphones using Bluetooth® 9 and a cellular data connection. Getting started is easy: Register your account and link your existing apps to Entune® App Suite, then download the Entune® App Suite app from your favorite App Store, such as iTunes® or Google™ Play and launch it. The addition of Slacker Radio adds even more music and listening options. Entune® App Suite is a smarter, and more fun way to enjoy your drive. Just connect and go. 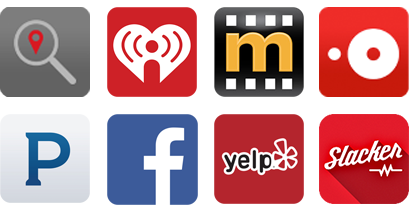 With Entune® App Suite 8 you can access Slacker Radio, Destination Search, iHeartRadio, MovieTickets.com, OpenTable® , Pandora® , Yelp® and Facebook Places. On Toyota’s available multimedia systems featuring Entune® App Suite 8, a variety of data services can help keep you in the know. Services include: Stocks, Weather, Traffic, Fuel Prices and Sports. All new Entune® App Suite-equipped Toyota vehicles come with complimentary access to Entune® App Suite apps and data services. Data Services – Packages Included Complimentary for 3 years. See siriusxm.com for pricing details following 3-year trial. * Vehicles include (MY13 Limited Avalon, MY13 Limited Avalon Hybrid, MY12/13 XLE Camry, MY12/13 XLE Camry Hybrid, MY13 Limited Venza, MY13 RAV4 EV, MY13 Land Cruiser, MY12/13 Prius Plug-in Hybrid Advanced, MY12/13 Prius Four with Delux Solar Roof Package, MY12/13 Prius Five with Advanced Technology Package, MY12/13 Prius v Five with Advanced Technology Package). With a paired compatible Bluetooth® 9 mobile phone and available Toyota multimedia system, simply press the voice command button on the steering wheel to easily make hands-free calls thanks to voice recognition. Using the multimedia’s touch screen and paired compatible Bluetooth® 9 mobile phone, browse contacts, place calls and even navigate to contacts’ addresses all without touching your phone. Does your smartphone have an MP3/WMA player? With Bluetooth® 9 streaming audio, listening to your music through the vehicle’s speakers wirelessly is easy. Pairing your phone is the first step in connecting with your Toyota for hands-free calling and for audio streaming via Bluetooth® 9. Siri® Eyes Free 25 allows customers with compatible iPhones to access Apple’s Siri® voice recognition system via the vehicle’s steering wheel controls and the in-vehicle microphone; responses are played back via the vehicle’s audio speakers. To use Siri® Eyes Free 25, compatible iPhone must be paired to the Entune™ system via Bluetooth. To launch Siri® Eyes Free 25 in vehicle, press and hold phone Off-Hook button. Available on select 2016 models. The Bluetooth® word mark and logos are registered trademarks owned by Bluetooth SIG, Inc. and any use of such marks by Toyota is under license. Other trademarks and trade names are those of their respective owners. The phones on this site claim to support Bluetooth® wireless technology audio streaming. Toyota does not endorse a particular phone or substantiate the Bluetooth® wireless technology audio streaming capability of the phones listed. Data services provided by XM Data Services on Premium HDD Navigation. iPod® and iPhone® are registered trademarks of Apple, Inc. All rights reserved. SiriusXM services require subscriptions, sold separately or as a package after trial period. If you decide to continue service after your trial, the subscription plan you choose will automatically renew thereafter and you will be charged according to your chosen payment method at then-current rates. Fees and taxes apply. To cancel you must call SiriusXM at 1-866-635-2349. See the SiriusXM Customer Agreement for complete terms at siriusxm.com. All fees and programming are subject to change. © 2014 Sirius XM Radio Inc. Sirius, XM and all related marks and logos are trademarks of Sirius XM Radio Inc. All rights reserved. DVD player functionality only available when vehicle is in Park with the emergency brake engaged. HD Radio™ technology manufactured under license from iBiquity Digital Corporation. U.S. and Foreign Patents. HD Radio™ and the HD and HD Radio™ logos are proprietary trademarks of iBiquity Digital Corporation. Availability and accuracy of the information provided by the navigation system or any XM services mentioned (if installed) are dependent upon many factors. Use common sense when relying on information provided. Services not available in every city or roadway. Periodic Entune app updates do not include navigation updates. Navigation updates are available at an additional cost from your local Toyota dealer. See your Navigation System Owner’s Manual or contact XM for details. Plug-in Hybrid Apps are only available on the Prius Plug-in Hybrid Advanced model. Plug-in Hybrid Apps include Charge Management, Remote Climate, and Vehicle Finder. Charging Station Map is currently only available on the multimedia system display. Smartphone Apps available summer 2012 at no additional charge include Charging Station Map and ECO Dashboard. Users will have the ability to opt-in to various levels of services. All Plug-in Hybrid Apps require an active subscription to Safety Connect® and download of Entune™ app to compatible smartphone. An active Safety Connect® account is required. Safety Connect® is dependent upon the telematics device being in operative condition, cellular connection availability and satellite signal reception. All Prius Plug-in Hybrid Advanced models come with a three-year complimentary trial account, which begins on the date the vehicle is purchased by the customer. Customers can register for Safety Connect® at the dealer, or by calling Safety Connect® customer care at 1-800-331-4331. Price shown is current at time of publishing, pricing subject to change without notice. Maximum operation duration of this system is ten minutes. System may not operate if the hybrid battery is under load or if the battery charge is low. While plugged in, this system operates using power from grid. See your Owner’s Manual for further information. By activating the Remote Climate feature, your vehicle’s accessory power will be powered on and any last known settings – for example air conditioning, radio and windshield wipers – will resume. Customers have the option of opting out of the Vehicle Finder application if so desired through the Entune™ account management website at www.myentune.com. Vehicle must be properly plugged into an operational power source and charge timer must be set to complete a Charge Now request. Pricing for Prius Plug-in Advanced Apps access post three-year complimentary trial period is an estimate. The addition of new Plug-in Hybrid Applications and services may warrant a price change. Applications and data services are subject to change without notice. Contact with the Safety Connect® response center is dependent upon the telematics device being in operative condition, cellular connection availability, navigation map data and GPS satellite signal reception, which can limit the ability to reach the response center or receive emergency service support. Enrollment and Telematics Subscription Service Agreement required. A variety of subscription terms is available; charges vary by subscription term selected. Always drive safely, obey traffic laws and focus on the road while driving. Siri® is available only on iPhone® 4S or later, iPad® with Retina® display, iPad mini™, and iPod touch® (5th generation) and requires Internet access. Siri® is not available in all languages or all areas, and features vary by area. Some Siri® functionality and commands are not accessible in the vehicle. Data charges may apply. See apple.com and phone carrier for details. Availability & accuracy of the information provided by Scout® GPS Link is dependent upon many factors. Use common sense when relying on information provided. Services & programming subject to change. Services not available in every city or roadway. Scout® is a registered trademark of Telenav, Inc.